At Off the Hook, a beachside lounge at Aulani in Hawaii you'll find many favorite tropical drinks and some unique. 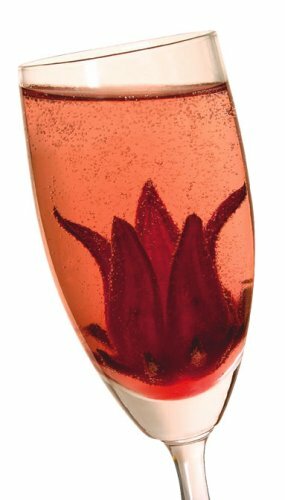 This wild hibiscus flower drink is just one of those uniquely special drinks you'll find. Pour in the Hibiscus syrup which will graduate from crimson at the bottom to light pink at the top. The flower will sit in the bottom of the champagne flute and slowly open up over 3-4 minutes. Looking to purchase wild hibiscus flowers? Try HERE.